Honda Accord Safety & Braking Pros and Cons | Page 1 of 2 | Why Not This Car? As usualy Honda Brakes are a little mushy feeling. I have had some pedal drop a little under very light braking, but the brakes seem to operate and stop the car as designed. 5 star safety rating my friends accord was recently totaled and it took the impact extremely well and barely phased him. This car has anti lock brakes, four wheel discs, ESC, side air bags, traction assist, nimble handling to avoid an accident & plenty of power from the V6 to get you out of trouble. Previous older model year vehicles did not have latest safety features. 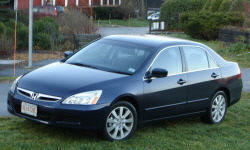 Accord has curtain airbags, traction and stability control, etc. It is state of the art, where many of my previous vehicles were not. Excellent brakes. Good airbags (side and front). Excels in panic stops. The Accord has great safety ratings, with front and side airbags. It also has rear passenger side airbag curtains. The vehicle is biased towards the rear brakes which causes less nose-dive on breaking and appears to offer better control in emergencies. Front and side air bags, ABS brakes with traction control. Had many problems with mine. After replacing master cylinder 3 times, Honde Techline decided to replace some other parts, and then it was fine. The brakes are really, really weak. Undercapacity/ undersized for the car. Much faded and long stopping distances. The rear brakes are basically ineffective. Since they are undersized the rotors overheat and warp. The Accord was highly rated for safety. The braking with 4 wheel rotor dics and short stopping distance. The air bag protection. Rates high in terms of safety. Side curtain airbags, front airbags, Built to absorb a crash. Only reasonable car at the time that had front, side, and head curtain airbags. ABS and traction control also. Great safety ratings, VSA, etc.